January 4, 2012 | David S. Maldow, Esq. Cisco's Umi home telepresence solution was first introduced in October 2010. The industry was excited to see a major push for consumer videoconferencing from the tech giant, but concerned about aspects of Umi's implementation. HPL's Howard Lichtman provided a thorough description of the solution with his thoughts and analysis in our initial coverage of Umi. Howard immediately noted two significant issues with Cisco's vision for this product; the cost, and lack of interoperability. In fact, Cisco's Umi confused many industry analysts from the get-go, with Rich Tehrani from TMC immediately predicting its demise. Business Insider has confirmed that Cisco will no longer be selling Umi. A Cisco spokesperson stated that they, "decided to no longer sell Cisco Umi hardware as a consumer offering. While we are ending the sale of Umi, the Umi service remains unchanged. Existing customers will continue to be able to use the service to make calls to other Umi subscribers or to Google video chat accounts." In early 2011, I assisted Andrew W. Davis and Ira M. Weinstein of Wainhouse Research with some informal testing of Umi and while I did like the product, I found it challenging enough to cause some serious concerns. We had firewall complications requiring assistance from Cisco support, the user guide had shortcomings, the UI was a little off, and the interop with Google Voice was disappointing. 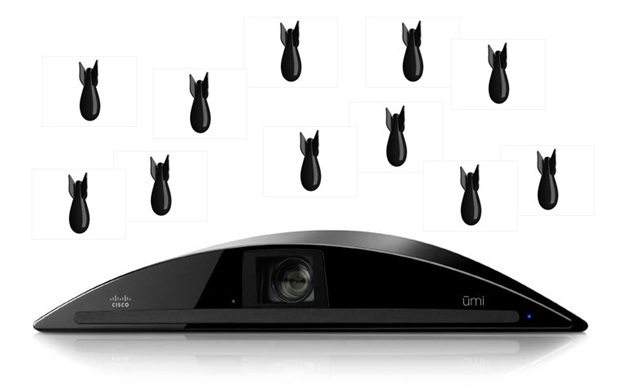 To put it in a nutshell, it was as if Umi was determined to repeat the major mistakes made by the videoconferencing industry over the last decade. The biggest mistake was relying on the magic of video to overcome product limitations. Once you got a Umi call up and running, it provided a really nice experience. New users certainly would feel a "wow factor" during a Umi demo. Unfortunately, wow factor does not equal adoption. The videoconferencing industry has been providing wow factor demos since the 1964 World's Fair, but we didn't start to see massive adoption until it became; 1) reliable, 2) easy to use, and 3) affordable. Umi didn't get high scores in any of these three categories from my testing. A Product Without A Market? Umi was first introduced costing $600 with a $25 monthly subscription. This price point is seriously problematic. It is shooting for a "pro-sumer" group of videoconferencing users that does not exist in large numbers at this time. Business class users with deep pockets will use a professional solution while consumer users have plenty of free options to choose from. Umi was originally targeted at something in between these two groups, "pro-sumer" users who are willing to pay $600 up front (plus another $300 per year) to upgrade from free desktop video to high quality living room videoconferencing. Unfortunately for Cisco, at the exact time they were marketing toward this group, middle-class consumers were cutting discretionary spending dramatically due to the economy. What was a small target market to begin with, became almost non-existent. Cisco reacted to this by shifting Umi to a business product as part of a restructuring, despite the fact that it was not designed to be a business solution. No one was surprised when this failed. 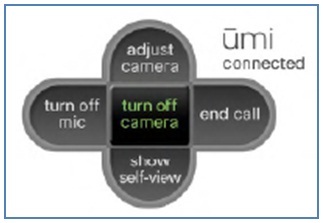 There is a list of requirements for business class videoconferencing that Umi did not even begin to fulfill. Umi's lack of interoperability was a concern when it was being sold as a consumer product and an absolute deal breaker when it was marketed as a business solution. It is rarely worth taking the time to consider a business solution that cannot connect to any of the over one million traditional videoconferencing endpoints (Cisco, Polycom, LifeSize, etc.) currently deployed. At the very minimum, Cisco should have partnered with a third party interop bridging service (such as Blue Jeans) to allow for Umi to traditional VC connections, if that would even be possible. Many professional and consumer solutions offer what I consider to be a reasonable substitute for full interop, in the form of guest accounts. Account owners can send an email to guests (non-users) inviting them to join a meeting. These invites include a link that downloads a guest version of the client and joins the conference. In some cases the link will simply direct the guest to a website running web version of the client, allowing the guest to participate in the conference with minimal downloads. The list of professional and consumer products that include the ability to send email invites to non-users is extensive. In the last month alone we have personally used this capability on Vidyo, LifeSize Connections, Logitech Vid HD, ooVoo, Skype, and Google+ Hangouts. The beauty of this feature is that users of any of these solutions can invite ANYONE with a webcam to meet with them. Umi's failure to include guest accounts in lieu of interoperability was a major oversight. To be fair, Umi does offer connectivity with Google Voice, which is a free service available to anyone. So technically Umi can be used to call anyone with a webcam. If that third party has a Google Voice account, or is willing to create one, and go through the process of adding the Umi user and Google user to each contact list, etc. Users do not like to go through steps to use video, especially guest users. There is a reason competing solutions are all offering a simple "click here to join my meeting" link for guest invites. People are willing to use them. Bottom line, yes, Umi users could call users of Google Voice. It worked, but it was awkward enough that I wasn't expecting a massive buzz from people making Umi to Google calls and I was certainly not surprised when it never happened. I can't argue with the desire to create this kind of solution. There is an obvious appeal to sitting on the couch with your family and seeing the other half of your family on the big screen in the living room, rather than huddling around the small screen in the office. Eventually someone will crack the puzzle and get this right. But Umi clearly wasn't that solution. Umi's flaws were called out by the analysts the moment it was released and we could only sit back and watch as once again the magic of video failed to convince users to overlook price and usability issues. 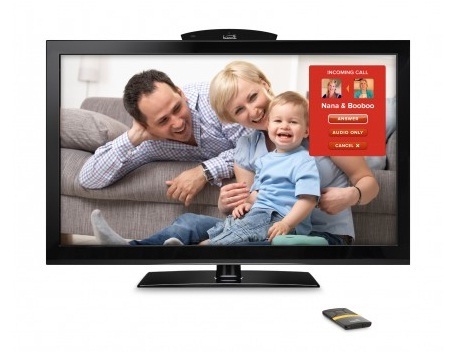 Cisco isn't the only company to miss the mark on living room telepresence. Creative announced a similar solution in January 2011 with their inPerson HD. It does not appear that the solution is available now (or was ever made available) and its camera has been repurposed as a "Skype Certified" webcam (a PC webcam). 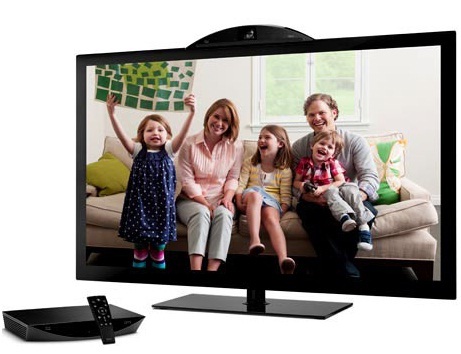 Logitech also offers living room telepresence as part of Logitech Revue (its Google TV offering). Logitech did manage to avoid some of the mistakes made by others. In particular, it uses its Logitech Vid software which has a guest client. Unfortunately, it appears that Logitech's Revue home videoconferencing may be a casualty of Logitech's decision to abandon Google TV. Human Productivity Lab President Howard Lichtman thinks that high quality solutions like Umi and GoogleTV / Logitech Revue with relatively expensive camera and hardware solutions are possible but require the same integration into the set-top box and price support that Tivo and DVR's enjoyed. In that example the hardware was integrated into the set-top box and price supported by cable providers who split up the initial cost and recurring cost into smaller monthly increments. Biscotti is a newer player to join the field, with a solution that looks very similar to the Umi. It costs $199 with no monthly fees, which is a vast improvement over the Umi pricing model and within reach of the target middle class demographic. Unfortunately, Biscotti appears to have the same interop limitations of Umi. Biscotti can call other Biscotti devices, or Google Voice. Will Biscotti be the lucky company to find the right recipe for home telepresence, will another new company jump into the field and get it right, or will the existing VC market dominators turn their focus and put some real resources towards developing consumer products? One way or another, I expect to be sitting on my couch and enjoying living room videoconferencing within the foreseeable future. David Maldow is a visual collaboration technologist with the Human Productivity Lab and an associate editor at Telepresence Options. David has extensive expertise in testing, evaluating, and explaining telepresence and other visual collaboration technologies. David is focused on providing third-party independent testing of telepresence and visual collaboration endpoints and infrastructure and helping industry participants explain complicated subjects through white papers and other end-user facing publications. Business Insider has confirmed that Cisco will no longer be selling Umi. A Cisco spokesperson stated that they, \"decided to no longer sell Cisco Umi hardware as a consumer offering. While we are ending the sale of Umi, the Umi service remains unchanged. Existing customers will continue to be able to use the service to make calls to other Umi subscribers or to Google video chat accounts.\"
To put it in a nutshell, it was as if Umi was determined to repeat the major mistakes made by the videoconferencing industry over the last decade. The biggest mistake was relying on the magic of video to overcome product limitations. Once you got a Umi call up and running, it provided a really nice experience. New users certainly would feel a \"wow factor\" during a Umi demo. Unfortunately, wow factor does not equal adoption. The videoconferencing industry has been providing wow factor demos since the 1964 World's Fair, but we didn't start to see massive adoption until it became; 1) reliable, 2) easy to use, and 3) affordable. Umi didn't get high scores in any of these three categories from my testing. Umi was first introduced costing \$600 with a \$25 monthly subscription. This price point is seriously problematic. It is shooting for a \"pro-sumer\" group of videoconferencing users that does not exist in large numbers at this time. Business class users with deep pockets will use a professional solution while consumer users have plenty of free options to choose from. Umi was originally targeted at something in between these two groups, \"pro-sumer\" users who are willing to pay \$600 up front (plus another \$300 per year) to upgrade from free desktop video to high quality living room videoconferencing. Unfortunately for Cisco, at the exact time they were marketing toward this group, middle-class consumers were cutting discretionary spending dramatically due to the economy. What was a small target market to begin with, became almost non-existent. To be fair, Umi does offer connectivity with Google Voice, which is a free service available to anyone. So technically Umi can be used to call anyone with a webcam. If that third party has a Google Voice account, or is willing to create one, and go through the process of adding the Umi user and Google user to each contact list, etc. Users do not like to go through steps to use video, especially guest users. There is a reason competing solutions are all offering a simple \"click here to join my meeting\" link for guest invites. People are willing to use them. Cisco isn't the only company to miss the mark on living room telepresence. Creative announced a similar solution in January 2011 with their inPerson HD. It does not appear that the solution is available now (or was ever made available) and its camera has been repurposed as a \"Skype Certified\" webcam (a PC webcam). Biscotti is a newer player to join the field, with a solution that looks very similar to the Umi. It costs \$199 with no monthly fees, which is a vast improvement over the Umi pricing model and within reach of the target middle class demographic. Unfortunately, Biscotti appears to have the same interop limitations of Umi. Biscotti can call other Biscotti devices, or Google Voice. Will Biscotti be the lucky company to find the right recipe for home telepresence, will another new company jump into the field and get it right, or will the existing VC market dominators turn their focus and put some real resources towards developing consumer products? One way or another, I expect to be sitting on my couch and enjoying living room videoconferencing within the foreseeable future.